Arya has started to pay attention when I point to objects and identify them by name. Since this represents the first steps toward learning to talk, I’ve been looking for simple baby books that associate names with pictures of objects. 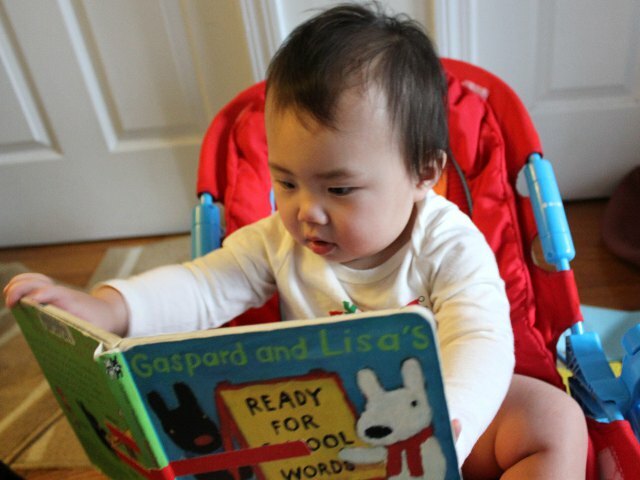 Gaspard and Lisa’s Ready For School Words by Anne Gutman and Georg Hallensleben was a great choice for introducing my baby to basic words. Ready For School Words combines a short story with cute illustrations focused on the lives of six-year old doggie friends Gaspar and Lisa. In addition to a brief sentence about the picture, each page also has a single word which identifies the major object shown in the image. The plot revolves around Gaspard and Lisa’s day at school. The each get ready for school in their own house, play at school during the day, and leave school together at the end of their day. All of their activities are depicted in cute, hand-drawn illustrations with an accompanying sentence on each page. The individual vocabulary words focus on basic items such as toothbrushes, blocks, and cookies. While some children will enjoy reading Ready For School Words to practice learning those specific words, I view the book as more of an introduction to the concept for younger kids. Even if Arya isn’t able to learn the words in the book, she seems to grasp the concept that a specific word is associated with a specific object. Gaspard and Lisa are the stars of a famous U.K. cartoon. Although produced abroad, the cartoon is available in the U.S. on cable broadcast and fans of the cartoon will be attracted to the book series. Gaspard and Lisa’s Ready For School Words is a great way to introduce young toddlers to the concept of learning vocabulary. Older children will get to practice reading with simple phrases while younger babies will appreciate the fast pace and colorful images. Gaspard and Lisa’s Ready For School Words is not commonly available in the U.S. Both new and used copies are available from third-party merchants on Amazon.